Addfield supplies the most efficient, robust incinerators in the worldwide marketplace today. Our incineration machines are renowned for their strength, reliability & longevity. Being the UK’s leading manufacturer of quality equipment for over 30 years proves that the Addfield range of machines are reliable and have the durability to stand the test of time. Our equipment has become the leading equipment to solve all waste solutions. Where most of our competitor's machines last 2-5 years, the very first Addfield machine was built over 30 years ago and is still in operation. Unlike its competitors, Addfield insists on specific machines for specific applications, we do not believe one machine fits all applications. You will note from our range that we have different designs for different industries. The Addfield machines are unique in their own right as we utilise Computational Fluid Dynamics software to design our incinerators, this software helps us predict gas flows, cold spots, burn rates and ensures fuel-efficient solutions. It is the same software used to design Formula 1 cars, Petrochemical Refineries and much more high-tech industries. Our unique designs are handcrafted by our highly skilled workforce. Traditional methods of construction are used by time served masons to create our robustly built and thermally efficient machines. Utilising these traditional methods and skills ensures the buyer a realistic return on their investment. But don’t just take our word for it! Come and visit us to see our craftsmen at work. Unlike its competitors, Addfield insists on specific machines for specific applications, we do not believe one machine fits all applications. You will note from our range that we have different designs for different industries. 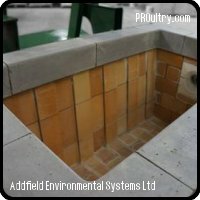 The Addfield machines are unique in their own right as we utilise Computational Fluid Dynamics software to design our incinerators, this software helps us predict gas flows, cold spots, burn rates and ensures fuel-efficient solutions. It is the same software used to design Formula 1 cars, Petrochemical Refineries and much more high-tech industries. Our unique designs are handcrafted by our highly skilled workforce. Traditional methods of construction are used by time served masons to create our robustly built and thermally efficient machines. Utilising these traditional methods and skills ensures the buyer a realistic return on their investment. But don’t just take our word for it! Come and visit us to see our craftsmen at work.